Spring time in the mountains - it just does not get better. Temps in the 70's, rushing rivers, bursting greenery, and active bears. How about 6 days of combined hound dogging and spot and stalk for mountain black bears. We dog bears with our pack of treeing hounds during early mornings till the winds shift, and then relax through the warm part of mid day casting to rainbow trout. Evenings we grab binos, spotting scopes, and rifles and go in search of bears feeding in avalanche slide chutes and grassy meadows. 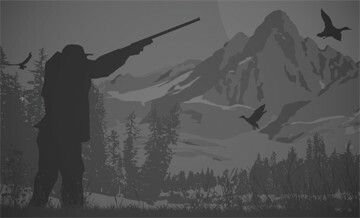 Our first hunt also offers Merriam turkey hunting. Can add a second bear for $500. High concentrations of bears combined with two styles of hunting, beautiful weather, amazing mountain scenery, turkey and trout, and there is not a finer or more enjoyable bear hunt anywhere.